Swimming with dolphins will give you a lot of pleasant emotions and will be a wonderful memory for a lifetime. In Moscow such possibility is provided by the Dolphinarium at VVC. Dolphin — an unusual but effective way to relieve stress and again to appreciate the beauty of the surrounding world. Dolphins direct and very kind. And they love to play with people like children, and adults. 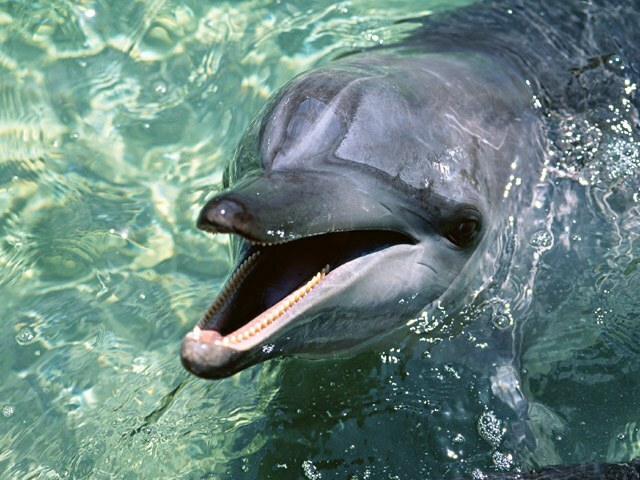 After swimming with dolphins improves health, there is a charge of vivacity and positive. Affectionate and intelligent animals help the person to remember that he is a part of nature. "Delfin lend" to date, the only institution in the capital, where you can swim with dolphins. The service costs from 5 to 10 thousand rubles. To communicate with the animals in the water within 10 minutes. You can pre-visit the show to look at the pool environment. You can swim all days of the week except Monday. The exact time stipulated when purchasing the ticket. All applications previously agreed, the payment is given for three days. You can buy a gift certificate for home delivery and pay for the service in cash or by credit card. The dolphins, who accompany the visitors, his name is Ramses and Bella. Sea creatures swimming with humans under the supervision of an instructor. Classes are held with mandatory safety and health standards. Fear of animals is not necessary, they do not bite and are very friendly. On the contrary, they will help visitors to relax and feel the joy of life and movement. It is important to know that people with disabilities and children with disabilities need special classes with the doctor. The Dolphinarium only provides entertainment services. To swim with dolphins is open to all people over seven years without health problems. People must be able to swim and be trained with a trainer. Before the swim definitely taken a shower, I need a personal Slippers and a towel. The visitor must implement all recommendations of the instructor who observes the scene from the dais. It clearly says that you can do and what you cannot, monitors the behavior of dolphins and humans, preventing possible problems. Visitors come 10 minutes before the start of classes, late arrivals are not permitted. It is permitted to photograph or video. It is forbidden to swim with the dolphins, children under seven years of age, pregnant women and people suffering from skin diseases. Violations may lead to removal from the pool without refund for the ticket. If you ever wanted to swim with dolphins, it's time to act. Chat with handsome and charismatic animal will benefit the mind and body. In addition, a significant amount of the proceeds for tickets will go to feed and the contents of dolphins. So you can thank these beautiful creatures and to help the Dolphin.